Fast fashion has transformed the way we shop. The advent of more accessible and affordable fashion means that consumers are shopping more than ever before. The number of garments bought by the average shopper each year grew by 60% between 2000 and 2014 alone. With new lines added on a weekly basis, consumers no longer need to wait for the seasons to change to buy the latest trends. High street chains have come to dominate the market, so much so that fast fashion giant H&M is now twice as valuable as Chanel. While many welcome the fashion revolution, accidents such as the Rana Plaza tragedy and accusations of exploitation have embroiled popular brands such as Zara, leading to questions over the industry’s ethics. Critics have also highlighted the impact that fast fashion brands have on the environment, fueling demand for cheap, disposable clothing that is carbon-intensive to produce and often ends up in landfill. The latest YouGov Omnibus research reveals the extent of clothes waste in Australia. It finds that three-quarters of Australian adults (75%) have thrown clothes away at some point in the past year and three in ten (30%) have thrown away more than ten items of clothing in the past year. A similar proportion (24%) have thrown away an item of clothing after wearing it just once and, in the past year alone, one in six (16%) have thrown away at least three items that they’ve only worn once. Fashion is big business in Australia, with one in five of those polled (21%) estimating that they own over 100 garments (excluding underwear or accessories). Millennials (those aged between 16 and 34) have the highest proportion of new clothing; 38% of millennials say they have purchased at least half of the clothes that they own in the past year alone. Just 9% of baby boomers (those over 55) that say the same. Millennials are also more likely to throw away clothes than older generations. One in six millennials (16%) say that, in general, they keep their clothes for under 2 years before throwing them away. Just 9% of baby boomers say the same. Not only do millennials dispose of clothes more quickly than their elders but they are also less likely to get rid of their unwanted clothes through sustainable means. Across all generations, four in ten (41%) have thrown unwanted clothes in the bin. The most popular reason for disposing of clothes is because they no longer fit, which 57% consider grounds for throwing garments away. Other common reasons to throw clothes away are because they’re damaged (chosen by 52%) and because they have developed a fault (selected by 40% of respondents). 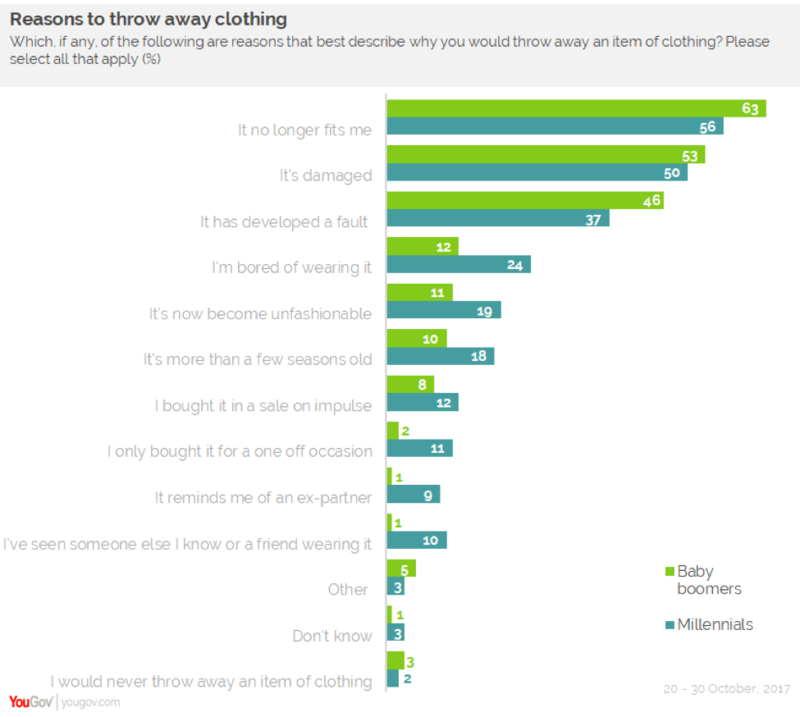 However, millennials are less likely than baby boomers to throw away clothes for fit and faults (see below chart), perhaps because they keep their clothes for less time than their elders, meaning they have less time to develop such problems over time. Instead, millennials are more likely to throw away clothes because their tastes change. Nearly twice as many millennials have thrown out clothes because it’s “more than a few seasons old” (18% compared with 10% of boomers). Similarly, a quarter of millennials (24%) have thrown away clothes because they are “bored of wearing it”, whereas half as many (12%) of boomers have done the same. At a regional level, Vietnamese and Chinese consumers are the most likely to keep clothes for under a year before throwing them away, where 27% and 23% do so (respectively). By contrast, Australians, Hong Kongers and Singaporeans are the least likely to keep their clothes for under a year – just 4%, 6% and 6% (respectively) say the same. However, Thais are the most likely to have thrown away more than three items of clothing in the past year that they have only worn once (17% have done so), whereas Chinese consumers are the least likely (8% have done so). On the other end of the scale, as many as 25% of Filipinos, 21% of Malaysians and 21%of Indonesians have not thrown away any items of clothing in the past year. *Data was collected online by YouGov Omnibus between 20 and 30 October 2017 among 2,536 respondents in Australia. Results are representative of the adult population.